Bronze AE20, 20mm, 6.46gm, issued 31/30 BC. Obv: NE BΠΣ, Bare head of Octavian right. Rev: ZHNOΔOPOY TETPAPXOY KAI APXHPEΩΣ, Bare head of Zenodorus left. References: Sear 5899, RPC 4774. 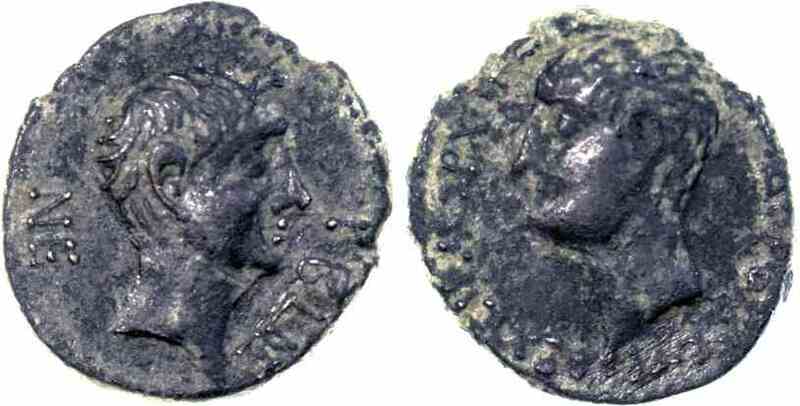 Zenodorus was the ruler of Chalcis appointed by Antony and confirmed by Octavian. Since he neglected to control the bandits in his territory, the land was taken from him and given to Herod to rule. When Augustus came to Antioch to make settlements in the East in 20 BC, Zenodorus petitioned the Emperor for his old territory. Herod also came but Zenodorus died before the emperor decided between the two rulers.